Nomani*, M., Hosseini, M., Vazirian, M., Nomani, A., Monsef-Esfahani, H. (2017). Evaluation of anti-inflammatory effect of Salvadora persica in IBD-induced rat. 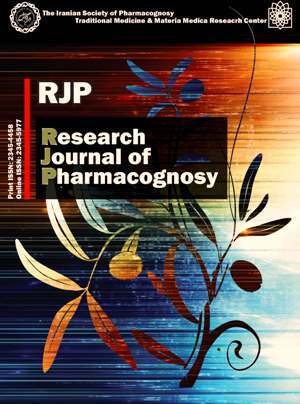 Research Journal of Pharmacognosy, 4(Supplement), 27-27. M. Nomani*; M.J. Hosseini; M. Vazirian; A. Nomani; H.R. Monsef-Esfahani. "Evaluation of anti-inflammatory effect of Salvadora persica in IBD-induced rat". Research Journal of Pharmacognosy, 4, Supplement, 2017, 27-27. Nomani*, M., Hosseini, M., Vazirian, M., Nomani, A., Monsef-Esfahani, H. (2017). 'Evaluation of anti-inflammatory effect of Salvadora persica in IBD-induced rat', Research Journal of Pharmacognosy, 4(Supplement), pp. 27-27. Nomani*, M., Hosseini, M., Vazirian, M., Nomani, A., Monsef-Esfahani, H. Evaluation of anti-inflammatory effect of Salvadora persica in IBD-induced rat. Research Journal of Pharmacognosy, 2017; 4(Supplement): 27-27. 2Department of Pharmacology and Toxicology, School of Pharmacy, Zanjan University of Medical Sciences, Zanjan, Iran. 3Department of Pharmaceutical Biomaterials, School of Pharmacy, Zanjan University of Medical Sciences, Zanjan, Iran. Background and objectives: Inflammatory bowel diseases (IBD) are among the most prevalent diseases in developed countries. In general, IL-6 and TNF-α are considered as the main causes of tissue damage in the intestine. Salvadora persica is a domestic and abundant plant growing in some central and southern areas of Iran. The main objective of the current study was to evaluate the potential anti-inflammatory effect of the hydro-alcoholic extract of Salvadora persica in a rat model of IBD. Methods: Acute colitis was induced by intra-rectal administration of 100 mg/kg TNBS dissolved in a total volume of 0.25 mL of 50% ethanol. Twenty-four h after colitis induction, saline, S. persica extracts (25, 50 and 100 mg/kg) and sulfasalazine (100 mg/kg) were orally administered to the corresponding groups of animals. The dose administration was repeated daily for seven consecutive days. Aftewards, body weight changes, macroscopic and microscopic lesions were assessed by dissecting 8 cm of the distal colons of the animals. TNF-α and IL-6 mRNA expression were also evaluated by real-time PCR. Results: The obtained results showed that sulfasalazine and S. persica extracts were significantly able to reduce the body weight loss, macroscopic and microscopic lesions compared to the untreated control. Additionally, they were able to decrease the expression of TNF-α mRNA in the colon tissue. Conclusion: The findings of this study indicated that Salvadora persica extract had an acceptable anti-inflammatory effect on the induced colitis in rat, and one of its notable mechanisms could be through TNF-α pathway.